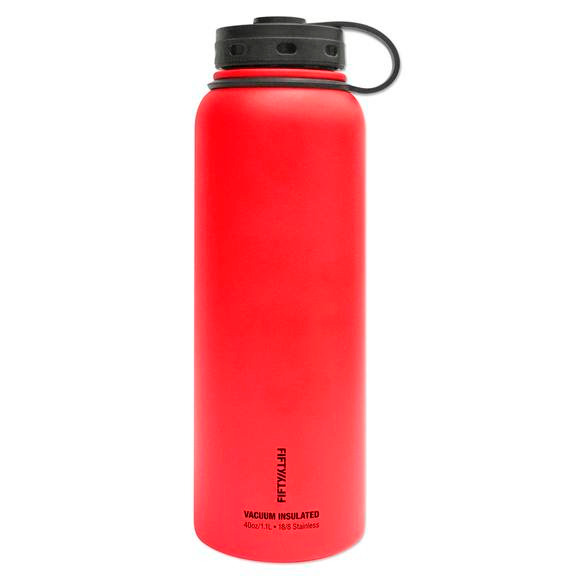 Fifty/Fifty's 40oz vacuum-insulated water bottles keep liquids hot or cold all day. This larger volume is designed for all-day hydration while you hop from work to the gym to a happy hour meet up. It's the ideal size to bring extra liquids when you won't have access to easy refills. Fifty/Fifty&apos;s 40oz vacuum-insulated water bottles keep liquids hot or cold all day. This larger volume is designed for all-day hydration while you hop from work to the gym to a happy hour meet up. It&apos;s the ideal size to bring extra liquids when you won&apos;t have access to easy refills. Aluminum can leach into water and therefore aluminum water bottles require a plastic or epoxy lining. Fifty/Fifty&apos;s bottles are made from food-grade stainless steel which does not leach so our bottles do not require a lining.